It is nearing club policy renewal date. 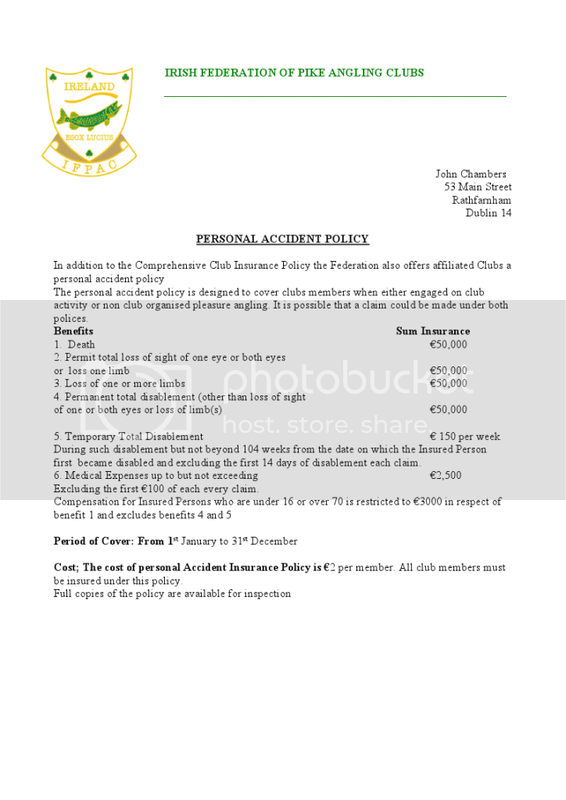 If your club dosent insure with us please study our policy. We really think that it is the best policy on the market. It covers all types of inland fishing including boating. A major plus is that club members are covered under the personal liability for claims taken against them due to accidents which may happen while fishing anywhere in the World apart from USA and Canada whether on holiday or club trip. Other club policies do not have this valuable cover included. Affiliation fees and insurance premiums flooding in now. 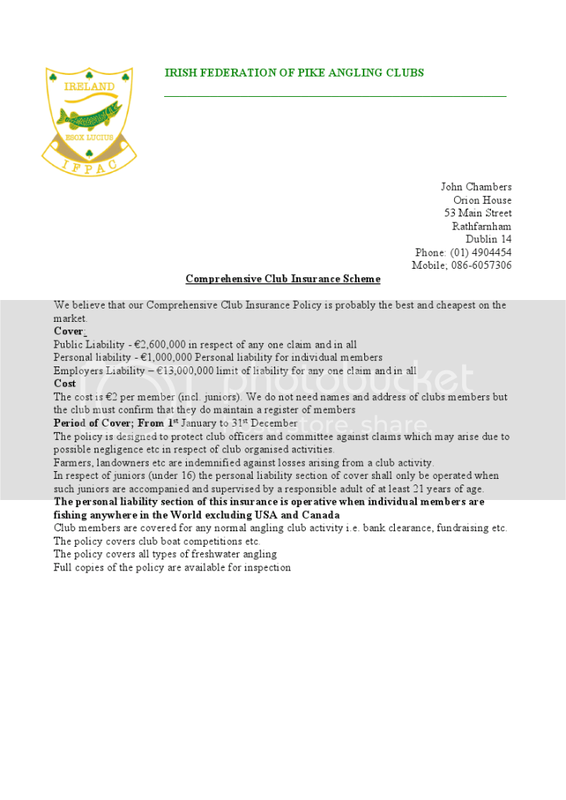 Make sure your club is insured for 1st January when 2010 cover runs out. Get your €75 affiliation and insurance premium in now !!!!!!!! While affiliation fees and insurance premiums are rolling in I would remind club committee members that their cover expires in a week and if they are holding competitions etc in January they will not be insured if their premium is not in. In the case of an accident it is the officers and committee members who could find themselves personally responsible !!!! Rossmore CAC has its first 2011 meeting this week. Speaking to the secretary, there seems to have been no correspondence in months of any kind? I just noticed this thread by chance, so who is the affiliation and insurance to go to, the Treasurer or Chairman? Who is sending out receipts? I would like to notify the committee. Indeed can I suggest that it might be courteous to write out to all clubs on this issue. Question: Will the policy be extended to indemnify IFI against any claim arising from IFPAC members becoming waterkeepers? The Angling Council will be meeting IFI on Thurs and I have no doubt that the waterkeeper document will be discussed in detail. I really dont see why IFI need insurance as it is the club who appoints and the Judge approves. IFIs role is just to say the person is suitable. I will take it that ACI will correspond directly with IFI on the insurance issue and let us know the outcome. Yes, I checked with Aidan. We have had no correspondence. Please check that Aidan’s address is still on the mail out list. I am sure the club would appreciate if a copy of everything sent recently could be forwarded to Aidan. Indeed, it would be an idea to convert all mail outs to PDF’s and simply email them to the club secretary’s, for those anyway that would be agreeable to that. I will check address in the morning. I am sure that we can email newsletters to anyone who wants them. Just to let you know the Erne Pike Angling Association has also not recieved any renewal information. Who are the chqs to be made payable to? Make cheques payable to I.F.P.A.C.